What is Leakage? Why is it important? Leakage is an air service development term. We thought we’d help educate you about why it’s important. Let's talk leakage. Surely everyone is familiar with leaks of some kind. We've all had a leaky faucet or a flat tire. Leakage, as most know it, is something escaping from where it should be confined. Whether the thought of a leak makes you think of water, air, or something else, the general concept is likely the same. In the airport world, leakage is what occurs when passengers from one airport's core market drive to another airport to catch a flight. In the vast majority of leakage situations, passengers from smaller cities drive to larger cities to fly. This can happen for many reasons. Some drive to the larger airport to catch a nonstop flight, as opposed to a connecting flight from their hometown. Others may hit the road as the result of a lower fare to their final destination. Ironically, many people who drive hours to save money on their fare may or may not save any money at all after adding up the value of time spent, gas, and other expenses associated with traveling to a farther away airport. Why should you care about leakage? What’s the big deal? Thinking locally, the Asheville Regional Airport leaks passengers primarily to Charlotte and, to a lesser degree Greenville and Atlanta. While our flight options and passenger numbers continue to grow, there still exists a fair number of people who opt to fly from another airport. When someone who lives closer to Asheville drives to Charlotte to fly, they’re actually contributing to the reason they chose to drive in the first place. As more people fly from our local airport, the airlines add bigger planes and flights to new places; each of which tends to lower fares over time (think supply and demand). This also increases opportunities for visitors and business travelers from other places to come to our region and spend money. The money you spend on your ticket ultimately puts more money into the local economy. Leaving the area to fly has the opposite effect. Fewer passengers leads to fewer planes, fewer destinations and higher fares… it’s a vicious cycle! Right now, AVL is in a position in which airlines are offering excellent connectivity, more seats on larger planes, and yes, the planes are pretty full. The region’s air travelers are using AVL more than ever before, which is great news! We hope this information helps you understand why we ask our region to “check AVL first.” The next time you’re about to book a flight from another airport, think about how much you’ll actually be saving and if your time is worth it. Of course, if you’re saving hundreds we don’t blame you. But if the savings isn’t that great to fly from an airport that’s two-hours away, it’s probably worth thinking twice about that 4 hours in the car — for you, and for your local economy! By now, almost all of us have heard about drones – you know, unmanned aircraft. You might’ve seen a news story about them, heard of their military use, or seen some teenagers flying one in the park. The FAA recently announced that the number of registered drones has surpassed the number of registered airplanes in the United States. As the many uses of drones evolve, it’s becoming increasingly apparent that they’ll be in the skies for quite some time. While they may be small in size, these remote controlled flying machines have been causing quite the stir. What exactly is a drone? In laymen’s terms, a drone is any unmanned flying machine that can be controlled remotely or with the aid of an onboard computer. Depending on who’s talking about them, you might also hear a drone referred to as a quadcopter, a “UAV” (unmanned aerial vehicle) or UAS (unmanned aerial system). Most civilian drones are relatively small—no more than a few feet in diameter and less than 50lbs. Some commercial and military models, however, have wingspans of up to 55 feet, feature jet engines, and can fly over 12,000 miles. Drones have been around for over a decade, but their popularity has skyrocketed in recent years with estimates of over 2 million units sold in 2015, up from roughly 300,000 in 2013. As drone numbers continue to grow, so do their various uses. It’s not uncommon to see drones used for aerial photography, surveying and even search and rescue. Some companies like Amazon are even seeking approval to use them for urban package delivery. Add in the number of recreational users zipping them through the skies for sheer enjoyment, and it’s easy to see how the drone population is soaring. They’ve proven to be great assets to many companies and allow many jobs to be completed faster, cheaper, and safer than ever before. Any enthusiast will tell you that drones are a blast to fly and some of their autopilot abilities certainly give them a “cool” factor. More than 325,000 people have now registered drones. There are so many drones flying that ensuring they safely share the skies with airplanes has become a focus of the FAA. At any given moment during the day, there are roughly 7,000 airplanes flying in U.S. airspace, along with an increasing number of drones. Every month in our nation, there have been roughly 100 pilot reports of drones flying in close proximity to their aircraft. These situations generally happen when a drone is being flown too close to the approach or departure paths of an airport. That said, there have been zero collisions between drones and aircraft. There are FAA guidelines for drone or model aircraft operations that exist to prevent such instances and the FAA continues to adapt their regulations to ensure that drones and aircraft share the skies safely. If you own a drone or are looking into purchasing one, the FAA website provides everything you need to know to safely operate your aircraft. As of December 2015, all drones between .55lbs and 55lbs must be registered online with the FAA before flying them outdoors. Drones over 55lbs must go through the standard aircraft registration process, just like an airplane. Any U.S. citizen over the age of thirteen can register a drone and the FAA even has an online chart for helping you determine whether or not your drone needs registered. Registration is just one of what will likely be many steps taken by the FAA to help drone users safely share the skies with aircraft. Additional rules apply to commercially operated UAS, and it is the operator’s responsibility to be educated and in compliance. Lastly, while the FAA is working hard to define its regulations regarding drones, it is very important for drone owners to understand that there are state and local laws pertaining to operation of drones, as well. The North Carolina Department of Transportation Aviation Division is ahead of the curve in its efforts to educate UAS owners and operators, and they offer a robust on-line program that educates about how to legally operate drones in North Carolina. Learn more here. Large and small, fast and slow, drones are here to stay. Do your part and familiarize yourself with all you need to know to operate your drone legally and safely. (Fletcher, N.C.) Asheville Regional Airport (AVL) served a record number of passengers in calendar year 2015: 392,713 passengers enplaned at the airport in 2015, and 394,324 passengers deplaned, which is an overall 4% increase compared to 2014, the previous record year of passengers served. The air service offerings at AVL have changed in the past few years. The airport continues to be served with a strong number of frequent daily flights to major hubs offered by legacy airlines American, Delta and United. At the same time, Ultra Low-Cost Carrier (ULCC) Allegiant Air has continued to grow its presence in the market. In 2015, Allegiant added its fifth non-stop destination (Palm Beach International Airport), and designated AVL as a hub of operations, basing two aircraft, crews and a maintenance facility at the airport. AVL was identified as the best connected non-hub airport in America in 2013 by MIT's International Center for Air Transportation, and has enjoyed continued growth since that time, now classified by the Federal Aviation Administration as a small-hub airport. Seats in the market have been strong, and a look ahead shows continued growth on the horizon, beginning with Allegiant’s new non-stop service to Baltimore/Washington International Thurgood Marshall Airport in May. Do you ever wonder why some airlines' tickets cost so much less than others, or why some charge more for baggage and seat selection? Every business in every industry is a little different than its competitors and airlines are no exception. Within aviation, airlines are generally grouped into three categories: legacy (or “network”) airlines, low cost carriers (LCCs), and ultra low cost carriers (ULCCs). While no two airlines are exactly alike, almost all of them fall into one of these categories. Ultra low cost airlines like Allegiant, Spirit and Frontier have the goal of offering the lowest ticket price possible. Their tickets can be described as “no frills” and things like bags, seat selection, and onboard food and drinks generally cost extra. They are extremely cost-responsible in their operations and management, which allows them to offer the lowest airfares. By not including the cost of a bag, snacks, drinks, in-flight entertainment, and other amenities in the ticket price, these airlines can often offer extremely low fares and high value. ULCC’s generally cater to people going on vacation or enjoying other forms of leisure travel, but each one does so differently. Frontier and Spirit almost exclusively fly between very large markets, with at least one roundtrip flight per day, and they don’t mind adding routes that other airlines already fly. Allegiant’s core model is to fly from small- or mid-sized communities (just like us) to very popular leisure destinations a few times per week. Many consider this a relatively new airline business model, but it’s more or less a refining of the low cost carrier model that some airlines have been using since the 1970s. When we say “low cost carrier” the first airline that pops into your mind could very well be Southwest Airlines, as they’ve been flying since 1971 and touting low fares and friendly service as they’ve grown into the nation’s largest domestic airline in terms of the number of passengers carried. These days, however, the LCC category has become a bit less defined than it once was. The term actually has more to do with an airline’s operating costs than with its ticket prices, which are simply a result of the low operating costs. Frontier and Spirit were once LCCs but transitioned to become ULCCs. Other airlines in this category like JetBlue and Virgin America are regarded as low cost carriers by some and not by others. Some would say that the traditional LCC’s like Southwest and JetBlue have slowly transformed into carriers whose fares aren’t always “low” but are never “high” and include some amenities in their ticket price. As these airlines have matured, they’ve grown into having large networks with far more connecting traffic and have added passenger comforts like in-flight entertainment, which raises the cost to operate. Last but not least, the network airlines are the mega-brands that have been around in one form or another since the dawn of commercial aviation. American, Delta, and United are the three U.S. network airlines. These are the most “evolved” airlines and have global route networks, huge hubs, huge fleets and multiple types of aircraft. With aircraft ranging from 50 to nearly 400 seats, network airlines can get you from Asheville to Shanghai, often in just one stop. They carry a wide array of passengers, including leisure and business passengers traveling domestically or internationally. They have sophisticated products that cater to business and international travelers. First-class cabins, club lounges, in-flight entertainment and Wi-Fi have become core products for this group of airlines. They’ll happily connect you to Florida for vacation, as well as London or Boston on a last-minute business venture. As the industry and the consumer both continue to evolve, so do the airlines. Throughout history, airlines of all types and sizes have come, grown, evolved, changed and gone. Once mighty legacy airlines like Pan Am have gone under and others like Piedmont have become part of the lineage of today’s airlines through mergers. The only constant is that regardless of your budget and destination, there will almost always be an airline built to cater to you. A runway is important to Western North Carolina! Take a journey with us to learn why. They say a mile of highway will take you a mile but a mile of runway will take you anywhere. When your plane takes the runway at Asheville Regional Airport, takeoff thrust is applied and after approximately one mile of acceleration, you gracefully begin to soar airborne. You didn’t just depart for Atlanta, Charlotte, Florida, New York or Chicago. You just entered the vast, global air transportation network. You could be headed to the other side of the state or the other end of the globe. At a glance, a runway may appear to only be pavement with different colored lights and paint, but a runway is the greatest gateway to the world a community can possess, and a massive economic engine as well (to the tune of half a billion dollars in this case). At AVL, our runway allows our community to do business all over the world. It allows residents of Asheville and western North Carolina to easily venture to any point on the planet they please. Like a highway, a runway is also omnidirectional, both physically and figuratively. That same runway that lets you jet off to London for business or glide into Palm Beach for vacation also allows business travelers and visitors from far away places to come to our community. It lets them invest in our region — our families, businesses and quality of life — by bringing their own business here, visiting WNC to shop or sight-see and to experience this amazing region we call home. It’s for all of these reasons that the runway at AVL is worthy of our care and attention. Right now, we’re in the third of four construction phases that will result in a brand new runway, which translates to new opportunities for WNC. Starting this month and continuing over the next year, you’ll be able to see the construction of the new runway here at AVL as your flights take off and land on a temporary runway that is serving as a literal stepping stone to the future. Near the end of 2017, you will board a jet at Asheville Regional Airport. When your plane crosses the threshold of the runway and takeoff thrust is applied, you will accelerate down the smooth pavement, passing lights and runway markers, knowing that this mile of runway is taking our community higher and is giving you the power to go anywhere. Please take a moment to learn more about our important runway project, titled "Project SOAR." 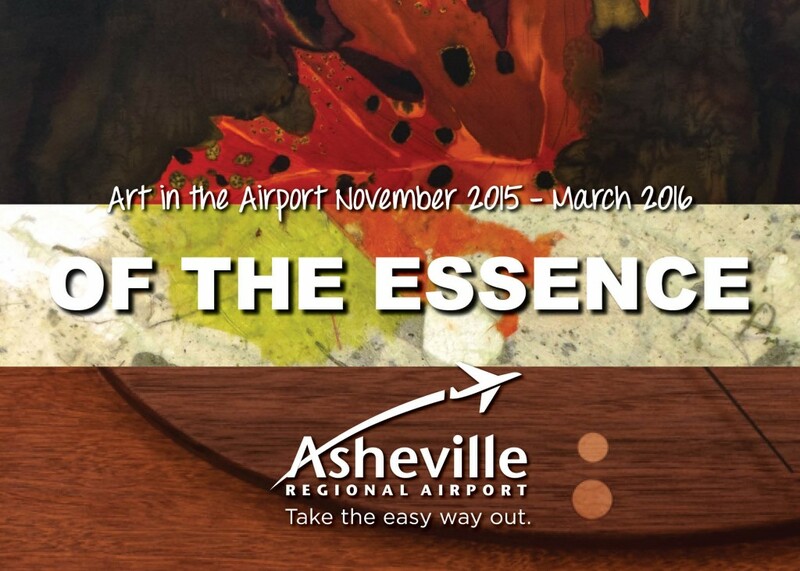 (Asheville, N.C.) Of The Essence, the newest Art in the Airport exhibit at Asheville Regional Airport (AVL) is now open through March 7, 2016. This exhibit showcases fine art pieces in a variety of mediums, from silk and paper to hardwoods. The paintings' vibrant colors imbue an essence of the season, while intricately crafted hardwood clocks create an essence of reflection. As viewers observe the gallery, they are invited to take a moment in "time" to enjoy the season. Three, western North Carolina based artists, Lisa De Girolamo, Kathy Goodson, and Connie Molland, are featured in the Of The Essence exhibit. Onlookers are able to see a variety of styles and methods used by the artists, as they tour the gallery. "The art gallery is truly a way for both the passengers and public alike to experience a taste of our region," said Alexandra Bradley, Marketing and Public Relations Specialist at AVL and curator of the gallery. Artwork can be purchased from the gallery by emailing art@flyavl.com. Artists who reside in any of the eleven counties within AVL's primary service market may apply for acceptance into upcoming exhibits. Details about the program, including application instructions, can be found on the airport's website at flyavl.com. What is that Unidentified Flying Object coming in for a landing at AVL? If you look to the skies, on a pretty regular basis around the airport you will see many different kinds of military aircraft. And this doesn’t make sense to many people – we don’t have any military bases in western North Carolina! But think about this: our military service men and women who fly military aircraft must continually train, build their hours in the air, and fly in different types of airspace and environments. Asheville Regional Airport is a high altitude airport in the eastern U.S., located within mountainous terrain. We are great training ground for the military. 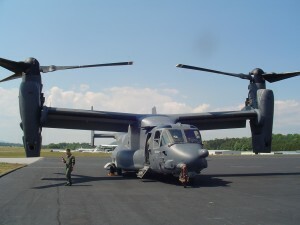 There are several military bases located within an easy hour or two flight from AVL – from Florida to the coast of North Carolina. We’ve even seen military aircraft here all the way from California! Most often, the military aircraft are practicing take-offs and landings, so they land and then immediately take off again multiple times in a row. These are called “touch and go’s” and are common training exercises. 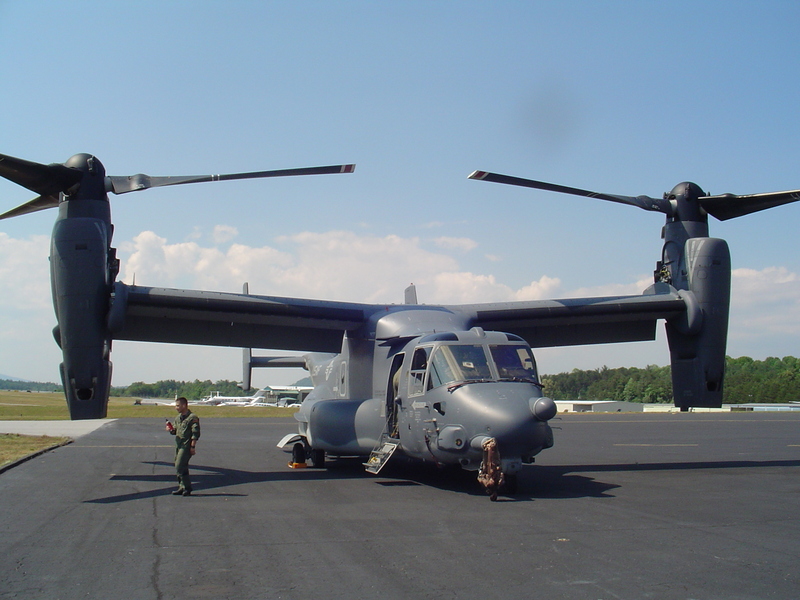 The photo above is of a frequent visitor to our area - a Boeing V-22 Osprey, operated by the U.S. Marines and the U.S. Air Force. We enjoy seeing these “UFO’s” when they come, and hope you do, too. As part of their Diverging Diamond Interchange Project, the North Carolina Department of Transportation is planning a temporary bridge closure for this weekend, starting November 13, at the I-26 and Airport Road location. (Asheville, N.C.) At the annual Airports Council International meeting in Long Beach, C.A. in October, Lew Bleiweis, A.A.E., executive director of Asheville Regional Airport, was elected as an Airports Council International – North America (ACI-NA) regional advisor of the ACI World Governing Board. Bleiweis currently serves as chair of ACI-NA’s U.S. Policy Board, a role that focuses on advocacy for legislative policy decisions that affect the airport industry in the United States. “It is an honor to be elected as a regional advisor to the World Governing Board,” said Bleiweis. “Airports are extremely important globally, not just from a travel perspective, but from an international economic perspective, and I look forward to being involved in continuing to shape a positive future for our industry.” “Asheville Regional Airport is being led by one of the airport industry’s thought leaders,” said Bob Roberts, Chair of the Greater Asheville Regional Airport Authority Board. “The airport has grown and thrived with Lew as our executive director, and the work he will continue to do with Airports Council International is important to the airport industry as a whole.” As the international association of the worlds’ commercial service airports, ACI represents the collective positions of its membership, which are established through committees and endorsed by the ACI Governing Board. These views reflect the common interests of the global airports community. ACI members operate 1,751 airports in 174 countries. Our airport is located in the mountains, and as such, we share our space with the critters who call WNC home. Early this month, we had a “critter visitor” who decided to stay a while. We named him “Buddy.” And he’s a black bear. Buddy climbed a tree near our parking lot one night, and hung out there for nearly four days. You may have seen his picture on television – our friends at WLOS heard about our bear from some passengers, and gave him his fifteen minutes of fame on the evening news! What you may not know is that we take our interaction with wildlife at the airport very seriously. We certainly want to respect our wildlife neighbors, and at the same time, deter them from coming to the airport. Safety is our top priority, and wildlife can cause unsafe conditions at an airport – especially if they are present in the vicinity of the airfield (or in public areas, depending on the kind of animal in that area). Buddy the bear is a good example. When we learned of his presence in the tree, we contacted state wildlife biologists to determine an appropriate plan to ensure public safety. We were told that the bear would most likely leave on his own, so our public safety department monitored him closely. Wildlife biologists were on alert to encourage him down from the tree and capture and release him, if needed. Fortunately, Buddy got bored with the view (and maybe wanted a quieter place to rest), and headed home. All commercial airports are required by the Federal Aviation Administration to have wildlife management programs in place. These programs include: (1) daily inspections of key areas at and around the airport – in which we look for things like wildlife, signs of wildlife and habitat issues; (2) wildlife control measures, such as fencing and habitat alterations; and (3) wildlife deterrent measures, such as use of “scare rounds” and bangers, which are noise tactics used to scare birds and other wildlife away from the airfield. At Asheville Regional Airport, we work closely with the North Carolina Wildlife Resources Commission to ensure that our wildlife plan is appropriate and effective. We train staff annually, and we inspect conditions daily. It is our responsibility, and a part of our focus on safety.